Eleanor Roosevelt kple Amegbetɔ ƒe Ablɔɖevinyenye ŋu Kpeɖoɖodzinyawo le Spaingbe me. Amegbetɔ ƒe Ablɔɖevinyenye ŋu Kpeɖoɖodzinya enye kpeɖoɖodzinyawo si Xexeme Dukɔ Ƒoƒuawo ƒe Takpekpegã la ŋlɔ daɖi le 10 Dzome 1948 le Palais de Chaillot, Paris. Ɖoɖo 30 le eme si dzi Xexeme Dukɔ Ƒoƒuawo da asi ɖo na amegbetɔwo katã le xexeame godoo. Le nuvɔ̃ɖi siwo Adolf Hitler kple eƒe asrafowo wɔ le Xexemeʋa evelia me ta la, amewo geɖe va bui be ehiã be woaŋlɔ sewo le amegbetɔwo ƒe ablɔɖevinyenye ŋuti. Esia na be Xexeme Dukɔ Ƒoƒuawo ƒe Nuŋlɔlagã tia John Peters Humphrey si tso Canada be wòakpɔ eŋɔŋlɔ dzi. Amesiwo kpe ɖe eŋu wodome tɔa ɖewo enye Eleanor Roosevelt tso United States, Jacques Maritain kple René Cassin tso France, Charles Malik tso Lebanon, kple P. C. Chang tso China. Xexeme Dukɔ Ƒoƒuawo ƒe Takpekpegã si kpe le 10 Dzome 1948 wɔ akametatia le nya sia ŋuti, eye dukɔ 48 lɔ ɖe dzi, 0 gbe, eye 8 mede dzesia ɖeke o.
Woŋlɔe abe dukɔ me sewo ene eye wodze egɔme kple Kpɔkplɔyiɖeme. Wokplɔ esia ɖo kpli ɖoɖo 30 sɔ̃. Woŋlɔ ɖe Guinness Book of Records la me be nyasiawo nye agbalẽ si gɔme woɖe ɖe gbe bubuwo me wòsɔgbɔ wu le xexeame. Xexeme Dukɔ Ƒoƒuawo ŋutɔ ɖe nya siawo gɔme ɖe gbe 366 me. 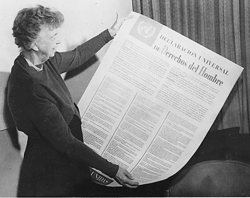 ↑ Eleanor Roosevelt Address to the United Nations General Assembly 9 Dzome 1948, le Paris, France. ↑ United Nations Decade for Human Rights Education (1995-2004)7 Anyɔnyɔ 2000. Xexeme Dukɔ Ƒoƒuawo ƒe Takpekpegã. ↑ Alphabetical Listing of All Translations (366) OHCHR. Metsɔ nya siawo ƒe akpa gãtɔ tso Eŋlisi Wikipiɖia la dzi le 13 Dasiamime 2007. Wotrɔ axa sia susuea le 09:59, 11 Tedoxe 2013.